Powers/Abilities: As the Blue Bulleteer, Laura was a skilled hand-to-hand fighter, training that she presumably still has. Now she is also a powerful magician. In addition she wears a Cloak of Darkness, an inherently evil mystic devise which she keeps under strict control by force of will, but which in turn provides her with a power source for her sorcery. 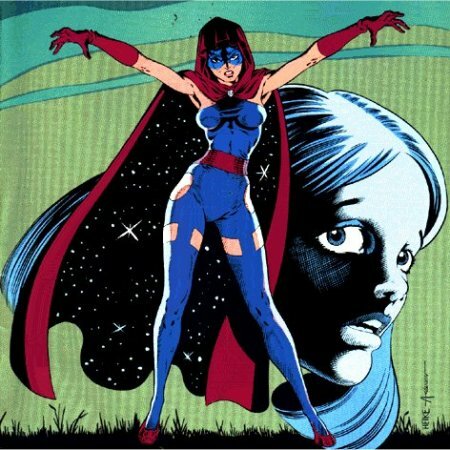 History: Originally a skilled, but non-powered World War II crimefighter known as the Blue Bulleteer, Laura Wright was kidnapped by an extra-dimensional wizard called Azagoth, who took her to the planet of Dark Dhagor, located in another dimension. There he trained her in the mystic arts, until eventually she returned to our world as the sorceress Nightveil. Comments: Nightveil was originally the Phantom Lady, whom A.C. had got hold of through the purchase of old Charlton Comics characters. However, D.C. Comics also claimed ownership of her through her earlier appearances in Quality Comics, whom they had purchased. With a threatened lawsuit, A.C. renamed the character. Thanks to Mike Murphy for the images of this character.